Heading down for the Pitt/NW game this weekend. Already have the hotel. Just need to find something to do after the game. Good Bars-restaurants-etc. There is a casino right outside of town that has a mediocre BBQ restaurant attached. The chicken places have good eats, Jim's steakhouse is good. Guadalajara has pretty good Mexican food, Napoli's has decent Italian as long as you get fresh made stuff, and not items they freeze. Gusano's has pretty good deep dish CHicago pizza. Mall Deli has good sandwiches. CHatters has a pretty good selection of Burgers, steaks, etc. There is a new cajun place in town, but I haven't tried it yet. The thai place has great flavor, but uses crappy meat. Bamboo has pretty good chinese that is fresh made instead of premade buffet type crap. If you have no taste buds, there are chains like RIb Crib, Applebees, BWW, etc too. No idea on the bar scene. I went to Farmhouse 2 weeks ago. It's between Frontenac and Pittsburg. It has a good menu of home cooked meals. I was skeptical but surprised. Shooters and The Pitt both have good burgers and SEK style onion rings. What do you mean, SEK style? I love Pittsburg and miss some aspects of living there, but a common theme you'll see in a list of local cuisine is "decent," "pretty good," and "it's OK."
Best bets are one of the chicken joints, or make the 20-minute drive over the tiny dot on the map called Scammon, Kansas, for some Italian food at Josie's. That said, the Mall Deli is fabulous for the price and Jim's Steakhouse (your typical small-town steak griller) was much better the last time I was there. Side note: It's been a half-decade since I lived in the area, so there may be some newer options that are worthwhile. The correct by-god way to make onion rings. Not sure what the proper term for them is (haystack onions?) but very thinly sliced, almost in a pile. Not your heavily breaded rings. 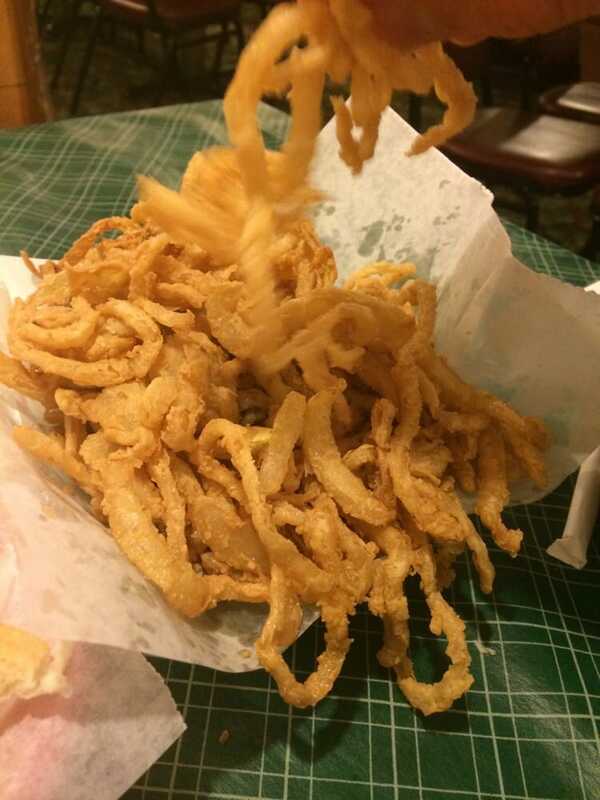 The style definitely didn't originate in SEK, but nearly all the chicken joints cook their onion rings this way. Most of the home grown restaurants here have similar onion rings. (the chicken places, Jim's, the burger places, etc...) Crispy, non heavy breading, thin sliced onion rings in a thin crispybatter. They are really good. The chicken places, for example have OK chicken, but the onion rings and the german potato salad are the only reasons for me to go there. Too true. There definitely isn't the "Wheat State Pizza"s any more. OOOOOO Harrys is open late, i believe. The place in scammon is pricey and is cash only. But good. There is also a German place in a barn on 43 hwy towards joplin. Good too. Shooters and the Pitt does have really good burgers. I can't in good conscience suggest a fried chicken place. Too cliche. Root Coffee house is really good. I hear good things about Mindy's Place(cajun) but it just opened. Its kind of a shame about Block 22 not being done yet. And that the Jolly Fox is unable to get the ball rolling on their building. But I hear there is a second one coming as well. Fort Scott's Brewery- Boiler Room Brewhaus is open, and they have good brews. I actually really like Typhoon, but can rarely justify the price. If you come down 71/49, you could stop in Lamar and try Capp's Cabin. It's a British themed fish and chips place. It's really good, but everything there is deep fied and really bad for you, so go easy. Great fish and hushpuppies, good crabcakes, great clams, and I hear their burgers are really good, too. Grub: The Chicken Restaurants are legendary, and there are a couple more in Barto's and Gebhardt's if you're willing and sober enough to drive to them. I grew up in Pitt, and a lot of the best locally owned restaurants are gone, but there's still some great food. Ok, now you guys have my mouth watering. Gonna have to try some of those onion rings. I forgot about 5th street, if it isn't dollar tacos, it isn't worth it. They do have a great beer selection.